If you are looking for the best basement flooring options, you have come to the right place. We know there are many different basement flooring ideas out there, so it is important to do some homework. The first step is to find out which flooring option will work well in your basement and which ones will not. Whether it's carpet for a basement, ceramic tile or luxury vinyl plank flooring, understanding the different options and where they will best work is key to making the right decision. 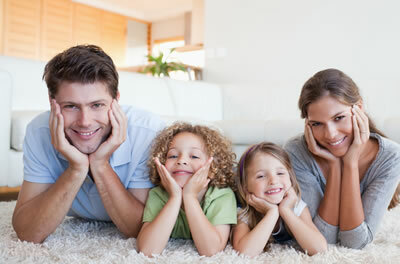 It is no surprise, as carpet is one of the most demanded flooring types* on the market. Basement carpeting can create a luxurious and comfortable feel like no other. If it is properly maintained and cleaned, your flooring will look good for many years. Vinyl products are also quite durable and can last for a long period of time. If taken care of correctly, you can have a stunning vinyl floor for years to come. Luxury vinyl is separated into two categories; luxury vinyl tile (LVT) and luxury vinyl plank (LVP). LVT is great for those homeowners looking for a natural stone look such as slate, marble, or cobblestone. LVP is for those who fancy a wood type flooring. Natural woods are usually not recommended for damper areas due to water damage. Vinyl plank will give you that wood look you want without all of the hassle of natural woods. It will also be much more affordable. Choosing the best basement flooring for your home is only half the battle. You now have the challenge of finding the right flooring company to install it for you. Make it easy on yourself and give The Carpet Guys a call. Whatever basement flooring needs you have, we know what it takes to get it handled, and we do it right the first time. The only thing you have to do is pick up the phone and give us a call. We have basement flooring estimates available. Get yours scheduled today!